BCU Health defence scene featuring Chinook and flags. BCU Health defence patient being carried to medic truck. Providing post-registration education for nurses and other allied healthcare professionals within the Defence Medical Services. Our flexible programme is tailored to meet the specific needs of the Defence Medical Services. 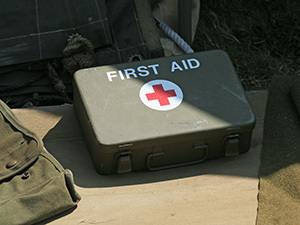 It can be studied as stand-alone modules, to complement your existing areas of expertise, or as a unique BSc (Hons) degree, which develops a full range of skills specific to defence healthcare. Other qualification options include Graduate Certificate and a BSc. Our Defence Healthcare Studies degree comprises a range of modules designed to enhance the expertise, understanding and qualifications of military nurses and allied health professionals. This module helps you to identify what constitutes 'best practice' within defence environments. An introduction to theories of professionalism and leadership within defence healthcare. Harness and build upon existing knowledge and experience of governance in practice. This module will focus on the patient journey from a multi-professional perspective.